Cream City Music offers a world-class guitar repair shop, specializing in vintage guitar repair and restoration. Our guitar restoration team is comprised of some of the most talented luthiers and techs in the industry, and we are committed to a level of service and quality that is second-to-none. Talk to us. - Unlike many repair shops, we encourage active dialogue between our team and you, our friends and customers. We believe the best setups, custom builds, & guitar and amp modifications can be achieved when you have a direct line to our experts. It's part of what makes Cream City Music unique. We want you to be part of the family. We do it all. - Whether you’ve got a starter-level Epiphone or a classic '69 Telecaster, we can provide the full complement of services, from precision setups, pickup installs, re-fretting, and headstock repair to custom modification or de-modification of your guitar or bass. We cover the entire range of servicing your gear. Don't see what you’re looking for on our menu? Drop us an email, chat with us live, or call us toll free. We're here to make your sonic ideas become reality! 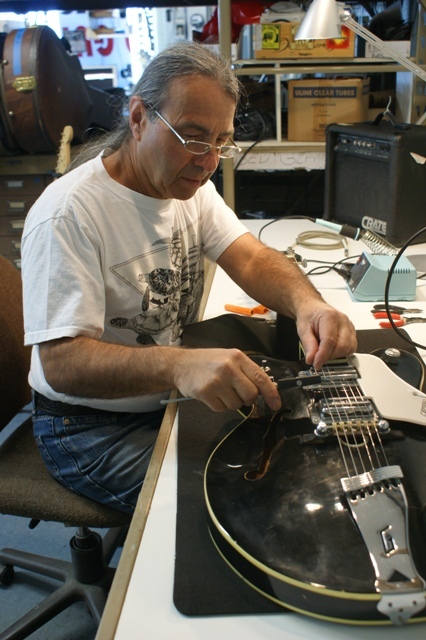 Whether it is a guitar setup or custom repair, the expert repair staff at Cream City Music has seen it all. Having a broken down guitar can be frustrating, so we understand how important it is to get your guitar back to playing as soon as possible. Check out our repair and customization pricing guide below to get a better idea about what we can do for you. Our Signature Service Setup is performed by our Master Luthier Ron Jones and begins with a complete assessment of the health of your instrument. With years of experience, Ron Jones will get your guitar playing for you like never before. A $20 surcharge will be assessed for 12-string, nylon-string instruments, and guitars with locking tremolo due to the increased amount of labor involved. Learn more about the Cream City Music “Signature Service” 35-Point Inspection. We install electronic components such as pots, switches, jacks, etc. Parts are not included in the price of installation. Our Master Luthier Ron Jones will create a hand-crafted and custom fitted bone nut for your instrument. We will reglue and repair your instrument's damaged headstock. Price is quoted based upon the severity of damage and whether or not you want to have the finish touched up. We can provide you an immediate quote upon inspection of your instrument. So many players are familiar with our Master Luthier Ron Jones that he is almost a brand name in Milwaukee. He brings world-class quality to our repair shop with over 25 years of hands-on experience building, repairing, and restoring fretted instruments. He is the go-to guy when something bad happens to your instrument – his depth of experience covers just about every type of repair under the sun. Ron performs all of the service work on Cream City's vintage instrument selection and on all customer repairs. His services include neck resets, crack repairs, custom bone nuts, total or partial refrets, heat pressing, headstock repair, binding repair, A+ setups, and so much more. He can cover all the bases for your service needs. If you have a question about an instrument repair, you can stop in our shop or give us a call and Ron will answer any questions you might have about your instrument. Tyler is the most recent addition to our in-house luthier team and has been repairing guitars professionally for the past six years. His first job was at the Beyond 11 guitar shop in downtown Milwaukee in 2012. He made the move to become luthier at Guitar Center, Brookfield in 2013. Tyler joined Cream City Music in February of 2017 and has since become an essential part of the Repair & Restoration team along with Ron Jones, our Master Luthier. Tyler’s services include: setups & restrings, advanced wiring and electronics, bone nut & bridge saddle carving, fret leveling & dressing, minor neck/body crack repairs, acoustic and electric pickup installation and body & binding repairs.